I was struggling to sleep last night, not helped by the fact I'd just installed a sudoku app on my phone, and after Moe settled down on my head I started to think about Lost. It's been months since the finale, but it still angers me how everything came together. A part of me wants to get the BluRay box set and watch the extra footage, but a part of me wants to forget it ever happened. What could have been one of the greatest TV shows of all time was really let down by the finale season failing to pull everything together in a clever way. I'm surprised it didn't end with Jack stepping out of the shower because it was all a dream (well they did say they weren't dead, but they never said it wasn't real!). PS The sudoku games is okay, but a couple of the puzzles ended with two ways of completing the last 4 boxes, which means it isn't a proper puzzle. It takes longer than pen and paper as I have to keep tapping the screen to select the box, then tap the number. Plus I have to keep tapping the screen to stop the screen lock from kicking in. 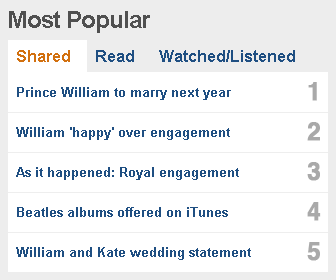 But there was one story that wasn't related to the addition to Her Majesty's family! It seems we can finally listen to The Beatles on our Apple devices. I'm obviously not counting anyone that had ripped their CD collection, or anyone that had illegally downloaded it. That leaves about... 5 people, right? Actually, it seems that over 2 million individual songs have been downloaded from iTunes. Imagine (okay, so that's a Lennon song) all the money that could have been made if they'd let it be on iTunes a few years ago. Ob-La-Di, Ob-La-Da, life goes on, bra. I can see why AV companies would be unhappy that Microsoft Security Essentials is presented. But I'm getting a bit annoyed that Microsoft are being forced to unbundle and offer choices to people just because their OS is the most popular. Some of us actually want Windows Media Player pre-installed, rather than downloading the setup file over the internet. Some of us want to use IE (with Protected Mode, SmartScreen Filter etc. ), and we don't want to download an optional update and pin the IE symbol back where it was. It's only a matter of time before we have to choose what calculator we use, what text editor we use, what patch management program we want to use (Windows Update is great, but what about something like Shavlik?). I wouldn't be surprised if the comment really does make it into Windows 8.